Funny man Jimmy Fallon can cook? Apparently so! This is his recipe for chili in the crockpot (OK, slightly, very slightly tweaked by me) and honestly it’s the best chili to ever come out of my kitchen! I bought a 12-pack of beer two years ago (does beer ever go bad??) so I’d have it on hand whenever I felt like making my favorite buttery beer bread (seriously the best bread evar! ), so I was super excited to finally get rid of the last two cans of it when I made this chili, one for the chili and one for the bread to go with it. Win-win! In a large skillet, working in batches if necessary, brown beef over medium heat. Season with salt and pepper; drain in a colander, discarding fat, and set aside. Add olive oil, onions, garlic, and habanero to skillet; season with salt. Cook until translucent, about 5 minutes. In a 6-quart Crock-Pot, combine beef, onion mixture, chile powder, oregano, cumin, and cayenne pepper; stir to combine. Add tomatoes, cilantro, and beer; cover and cook on high, stirring occasionally, for 5 hours, or on low for 8 hours. Add kidney beans and season with salt and pepper. Continue to cook, uncovered, until thickened, about 30 minutes. Garnish with cilantro and serve with desired toppings. Posted in Slow-Cooker/Crockpot, Soups & Stews and tagged baking, buttery beer bread, chili recipe, cooking, crock pot, crockpot, jimmy fallon, winter. Bookmark the permalink. We have beer that is really old too that I just have for cooking! Obviously not big beer drinkers here! 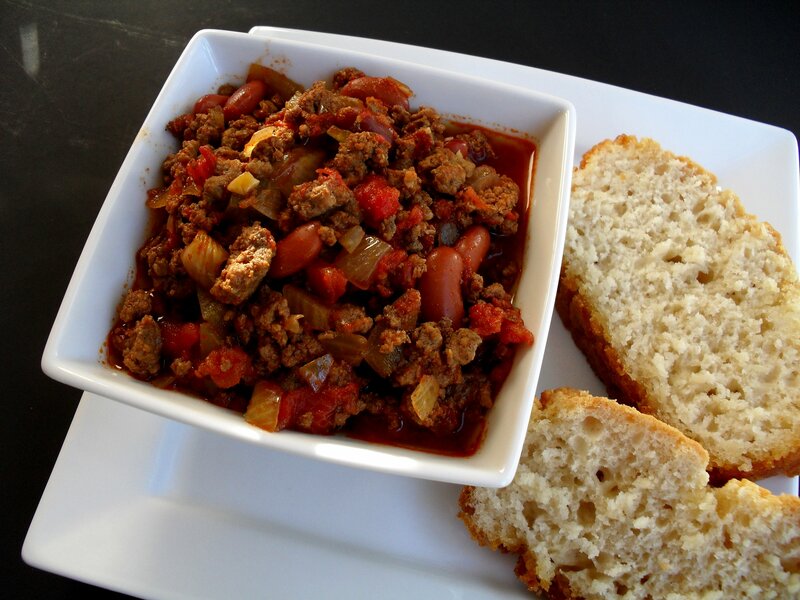 The chili looks great, but your mention of the buttery beer bread is what’s really making me hungry right now. I’m clicking on the recipe right now . . .
Love the spice of the habanero chili! I am pretty sure there isn’t a chili, unless its topped with diced onions, then I am out! So do we! 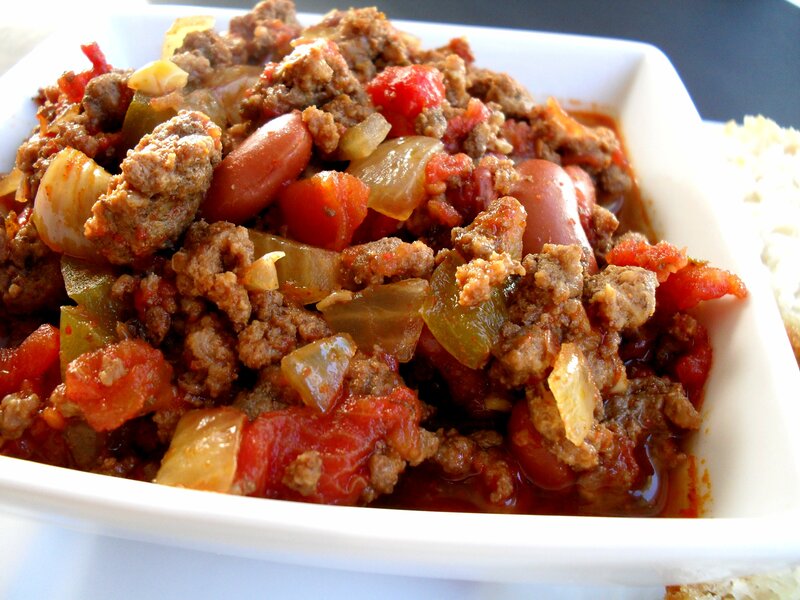 But this isn’t a spicy chili–for your tastes you’d need the whole chili, or more! I recently made chili with beer for the first time ever, and it was amazing (hmm, what is it about beer?)! Yours looks fantastic, especially served with your beer bread! I don’t know! We don’t like it on it’s own, but appreciate it in food and bread. Buttery beer bread? Holy cow, I’m in! This dish is right down my husband’s and son’s alley. I’ll have to put this on next week’s menu. Yum! 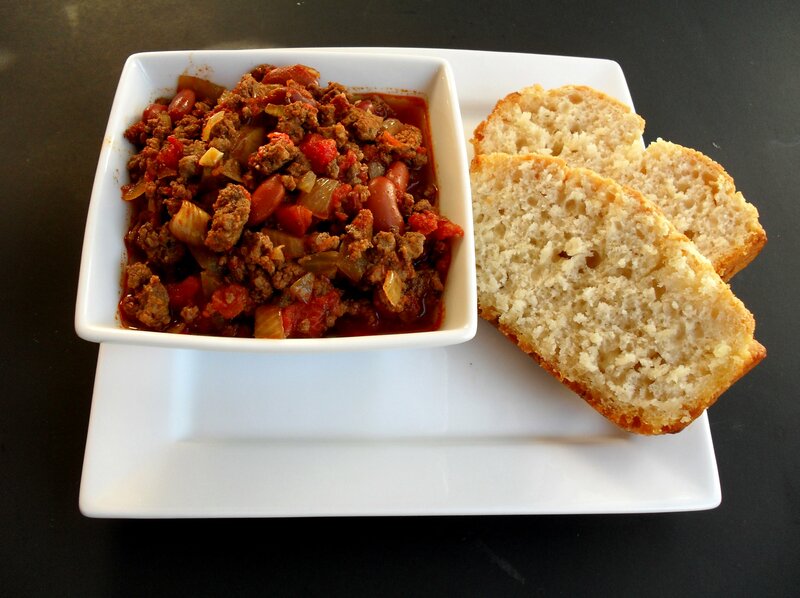 chili with beer and served with beer bread. Ooh-er! Sounds like a win-win combo to me! Yum and double yum. Another one we must try! I love Jimmy Fallon and his chili! How can i make this in a big pot instead? Last year it ran out too quickly at our party so i need to make more than our crock pot will hold! Just do it the same way, except heating it in a big pot on the stove. You’ll probably have to cook on low a few hours to get the best flavor.